We get it. Searching for the perfect gift this time of year isn’t easy. Lucky for you, we put together some of our fave gifts for everyone on your list this year. Even if you’re recipient isn’t a morning person, this box of Compass coffee, gingerbread maple syrup, bacon marmalade, and pancake mix will make them one. Bring some joy to their home or office with our mini-wreath tied off with a burlap bow. This festive succulent box with berries can last well past the holiday season. Perfect as a centerpiece or desk accessory. 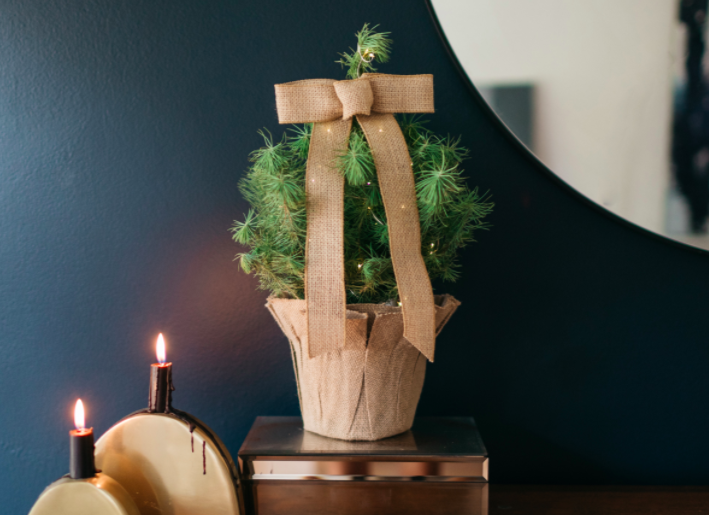 This tiny tree can turn any home or office into a seriously festive spot. And because we wanted to keep traditions alive and well, we included LED lights and a burlap bow for your decorating pleasure. Fact: No home is complete this holiday without a poinsettia. The Crosby comes with an engraved wooden crate that can be reused well after the poinsettia hits the curb. Coffee table looking bleak? Bar cart seen better days? Our golden elephant paired with a succulent is the easiest upgrade around. Shop all of our holiday faves here.